Inspired by cattails. Public Garden by the TILT. Singapore, 15 October 2010. Today is a special day. For the very first time we now have a Singapore public event - the i Light Marina Bay - that has the environment as the object, the means as well as the end. The three-week long festival, from 15 October to 7 November, strives to be as green as it can get. Light art installations – by local and foreign artists – mostly make use of recycled or recyclable materials, and are lit up by energy saving technology. 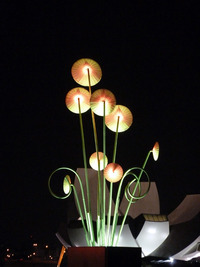 Twelve out of twenty sculptures use light-emitting diodes or LEDs that conserve up to 90% of energy usage. LEDs are twice as efficient as compact fluorescent lamps or CFLs and do not contain mercury. Metal halide, which is a form of high intensity density (HID) lamp, is also deployed in certain structures. 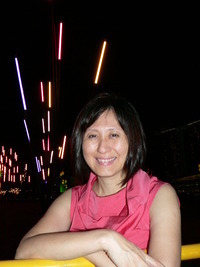 The festival is organised, according to Fun Siew Leng, the Group Director or Urban Planning & Design with the Urban Redevelopment Authority of Singapore (URA), to “give a strong sense of place and ownership of Marina Bay by the community.” URA is the presenter of I Light Marina Bay, while Maybank and Philips are the main sponsors. Festival organiser Smart Light Singapore has been instrumental in engaging building owners in the surrounding areas chipping in by switching off lights after office hours, and turning up air-conditioning temperatures. This is a refreshing change considering the amount of energy Singapore burnt during the night F1 race just weeks before, contributing to greater pollution, and needless to say adding on to global warming. I was told that during that time, the Singapore Tourism Board had urged the highrise buildings surrounding the circuit to leave the office lights on during the night, even when no staff is glued to the desk, so that the city will dazzle viewers around the world through live broadcast. I hope that’s a rumour. 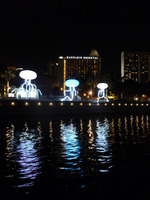 At I Light Marina Bay, people can view and admire the creative light art installations spread out along the 3.5km waterfront promenade at leisure, and for free (see map). The festival director Mary-Anne Kyriakou is keen for people to be inspired by dark, open spaces and to be connected with natural environments through the marriage of art and sustainable technology to keep the carbon footprint at minimum. She is also instrumental in educating and guiding the participating artists to embrace LED in illuminating their art without compromising on hues or effects. Alternative energy sources make their appearances at this festival of lights. Solar energy is used to supply 75 watts of electricity for Fire Flies by Francesco Mariotti. Human power or kinetic energy is tapped as one reels the Wattfish? fishing line on The Helix bridge. And 4,500 litres re-used oil from fried chicken, fries or char kay teow energizes a generator that illuminates the largest cluster of installation – My Public Garden by TILT. Display materials are shipped, not flown, into Singapore to reduce at least 40 tonnes less carbon dioxide emissions. Marketing materials are printed using FSC paper and using soy-based ink. You and I can get into the act. Take a recycled bottle or cup to to be built into windmills as part of a beautiful piece of art by Sun Yu Li called The Living! Project, coordinated by the People's Association for its PAssion members. Listen to a 'Smart Light Symposium' organised for free for public at URA Building on Monday 18 October from 4-6 pm. The public is encouraged to give up the use of energy guzzling halogen or incandescent lamps to energy saving options. Anyone can contribute one litre of used cooking oil in exchange for a CFL bulb sponsored by Philips on Saturday 23 October, 7:30-9:30 pm at The Promontory @ Marina Bay. Public should be advised that safe disposal of CFL is required, though, as it contains mercury. When disposed irresponsibly for example blown-out bulbs dumped in the fields or drains, or dropped, the shattered bulb releases mercury vapour, which is toxic to the environment. Bulbs thrown down rubbish chutes in Singapore apartments are especially harmful for cleaners who clear the garbage from the enclosed spot. Never handle the shattered contents with bare hands and ventilate the apartment for half an hour before picking up the pieces with gloved hands or vacuuming. The festival intends to track, monitor and document the environmental impact of the event and to assess the carbon footprint of the processes involved. 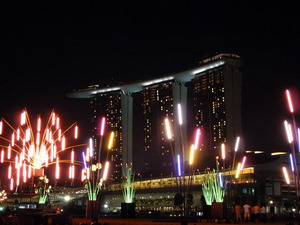 I Light Marina Bay is probably the first event in Singapore to do this, and the initiative is both needful and laudable. 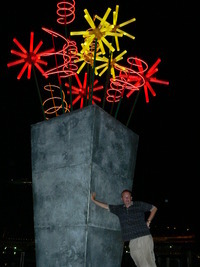 Anders Nilsson stands by Warren Langley's LED flowers. Perhaps the extent of public education of energy saving lights, the safe handling and disposal of CFLs and the recycling of light materials and batteries can be factored in the assessment to ensure that the festival is truly green as it hopes to be. As for i Light Marina Bay 2010 festival, I am sure it has set Gaia twinkling.